Well, here is my first report. First time using M1 0w40 in my car, didn't like it and will be switching back to 10w60. What didn't you like, looks like a great report. I ran a VANOS test in DIS and it failed the inlet leak test by just a hair over 5 degrees two out of four times. Ran the same test on 10w60 and it passed 4 times in a row. Coincidence? Or thicker oil? Not sure, but I will stick with 10w60 for now. Here's my first analysis. 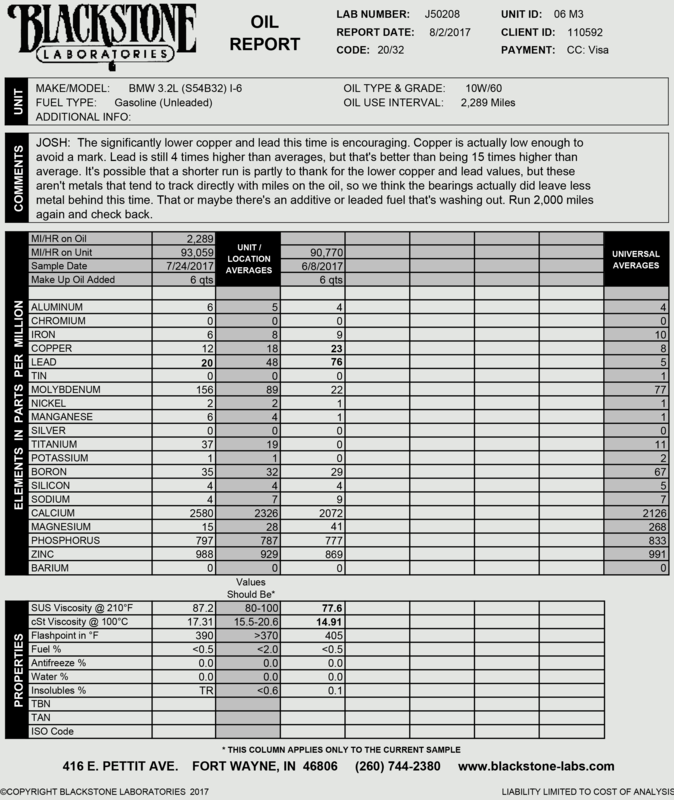 Bought the car with 98k, oil change every 5-5.5k miles with Liqui moly 10w-60. Rod bearing recall done at 25k by original owner, now at 113k. Is it time to change the rod bearings based off the lead and copper levels? Edit: Or can I wait to do another oil change/analysis and trend the numbers? Last edited by ///M3 MD; Wed, Sep-20-2017 at 02:33:13 AM. Ok finally hosted my first picture. Bought the car a few months ago and just hit 100k. There was approximately 6500 miles on this sample. I barely drive the car and plan to change every 5k. Any help you experts can provide would be awesome. Looks like lead is high and copper is low? What does that mean, any red flags? I have no idea if the previous owner used additives but I do know that track fuel wasn't used before it reached me. Last edited by binary; Wed, Sep-13-2017 at 10:30:25 PM. Was a little concerned, hopefully another oil change will clean out the system. 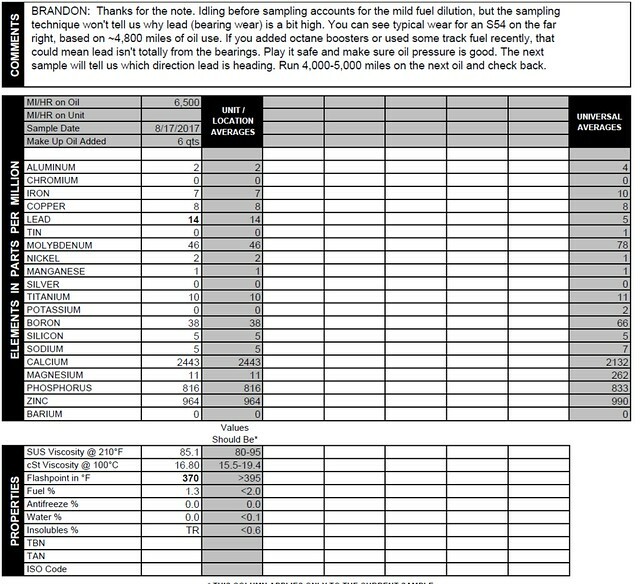 Unsure of how frequent previous owner conducted his oil changes. My oil samples have had copper and lead dancing around for awhile now. I don't know why Blackstone assumed I was using race gas or octane booster, my car has never seen either. I finally got to bearings this weekend, there's quite a few with copper showing! I've been babying the engine the past few months. I'm REALLY glad to finally have this done. My car just hit 146k. No knowledge of prior replacements. My car seems to have spent most of it's life doing trips up and down the east coast, maybe they're original. They had BMW part numbers. Found this in my oil pan.. I'm assuming it looks like a piece of timing guide? I tried looking up the front of the engine after I found it and didn't see anything. PO rebuilt the vanos so maybe maybe it's leftover? Also intriguing, almost all of the bolts were stretched/torqued slightly differently. One of the bolts the blank spot in the middle was barely elongated, some others definitely show some slight narrowing of the shanks like it might have been overdone. The detorque values across all of them were anywhere from 65nm to 85nm. Makes me curious if that was a contributing factor to how unevenly worn some of them are, a few of them were significantly easier to remove. Last edited by exodus454; Mon, Sep-18-2017 at 01:47:03 AM. This is Castrol's latest Supercar oil. I am definitely going to get another sample at 4,000 miles. Definitely looks like you are up for rod bearings. I certainly agree with you. However, don't you think you my wear levels are higher because I had a longer interval than the universal average? Just recently picked up an 04 m3. First day I owned it I did the oil change and analysis. This is what I got. Thoughts? I've since babied the car since getting the results back (driven slow and under 4k) and I am about to come close to the 1k mark and getting the oil sent in again. Is it possible the elevated levels are from an oil additive? Will post analysis when I get the oil results back. Last edited by jxnguyen; Wed, Sep-20-2017 at 01:49:31 AM. All times are GMT. The time now is 08:37:32 AM.